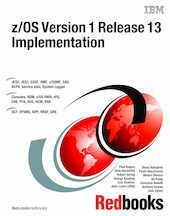 This IBM® Redbooks® publication provides information about installation and migration changes to be aware of if you are responsible for migrating systems from IBM z/OS® V1R10, z/OS V1R11, and z/OS V1R12 to z/OS V1R13. It also highlights actions that are needed to prepare for the installation of z/OS V1R12, including ensuring driving system and target system requirements are met and coexistence requirements are satisfied. There is a special focus on identifying new migration actions that must be performed for selected elements when migrating to z/OS V1R13.